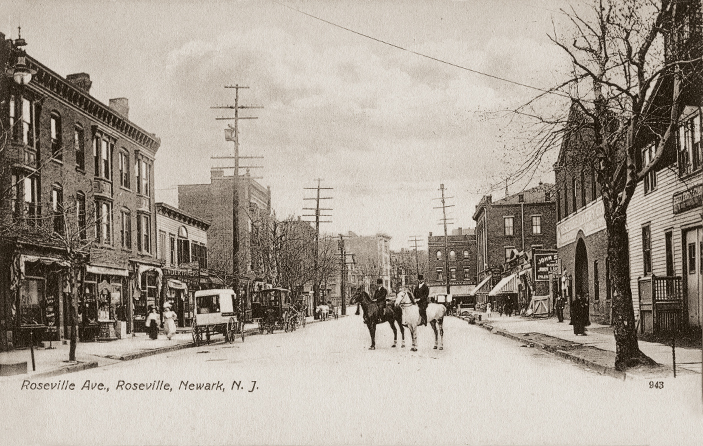 Although its beginning can be traced to Newark's earliest period, the Roseville section is really a child of the 19th century. It was developed like a city within a city much in the same way as Vailsburg, the Ironbound, Clinton Hill, Woodside, Forest Hill and eventually Weequahic. Early in its history, Roseville was the site of several large farms. The advent of the trolley made it a mini-city or suburb within Newark. The trolley made it easier to commute downtown, to 'go to business' and to participate in all the social and cultural activities that were available to an emerging middle class that demanded and got what it wanted from Newark's department stores, movie houses, markets, library, museum, parks and whatever else a metropolitan center could offer a demanding and mobile public. The name Roseville itself is attributed to three different theories. The most commonly held one is that it was named for the proliferation of wild roses growing in its early fields and pastures. This view was supported by Edward Rankin in his book 'Indian Trails and City Streets,' and by Rev. Charles T. Haley of Roseville Presbyterian Church in a sermon preached in 1903. Yet Regina Moore claimed the neighborhood was named for her grandfather, James Rowe, 'a popular alderman of Newark renowned for his genial spirit.' Rowe's home and extensive farms were scrupulously tended and considered among the 'showplaces of the area.' It was 'civic pride,' rather than a desire to perpetuate the name Rowe, that prompted him to relinquish the Roseville Avenue portion of his property for the development of Roseville. In his modesty, Rowe requested that the letter 'W' be deleted from the community's name for a more picturesque title.' (A letter to this effect from Moore appeared in the Newark Evening News, February 2, 1960.) A third but less popular theory was that the community was named for the late Frank McDermit, an attorney who constantly wore a rose in his buttonhole, and was known as the 'Rose of Roseville.' Over the years heated letters have appeared in the local press advocating why the community was so named. Whatever the truth, the name Roseville has stuck and will probably continue indefinitely. Although the area was not called Roseville at the time, this section of the city was part of the original Indian purchase by Robert Treat in 1666. For many years, it essentially was one big farm. Myrtle Avenue was the first street, opened by Capt. Aaron Peck. The name Roseville or Rowesville first appeared on a local map in 1853. By this time great stretches of land in the area were owned by Peck, James E. Bathgate and David J. Baldwin. The first building in the Roseville area belonged to a farmer named Tomkins in 1667. It was essentially a large room with a fireplace and loft. William Bathgate, who came from Scotland, purchased the house in 1848 and enlarged it to include a living room, kitchen, dining room and two rooms above. According to history, 'A front stoop was added with lilacs on either side, and a field, orchards, and gardens surrounding the house, while the highway to the hills ran past its front door.' Eventually, the Bathgate holding included 121 acres near today's Roseville Avenue. Peck's land was on the east side of Roseville Avenue nearly to Bloomfield. Baldwin's land was east of Roseville Avenue and north of the railroad extending to Sixth Avenue. Gradually, landmarks began to appear where farmers' fields had held sway. By the 1850s the village contained about 300 inhabitants, 30 houses and two large factories. The streets were described as 'comfortably wide,' a width of 80 feet, and nicely graded and planted, mostly with sugar maples. Roseville's two factories included 'the portable gas apparatus factory of some 50 feet by 25 feet, two stories high, divided into seven rooms for various departments of business pattern making, sheet iron work, a blacksmith's shop, finishing store room, and office and testing room.' The other building was a hardware factory containing an engine of 12 horsepower. The principal articles manufactured were builders' hardware, such as locks, door and shutter bolts, pulley, hinges and brass castings. In 1852, St. Barnabas Episcopal Church held its first service in September in a private house. Two years later Peck gave the church the triangle at land between Warren Street and Sussex and Roseville avenues for a permanent home. By 1856, 333 passengers traveled between Roseville Avenue and downtown on the new horse cars which preceded the electric trolleys. About the same time, the Bloomfield Branch was extended to Montclair. Better transportation was credited with helping to open up Roseville's growth and social life. Between 1850 and 1860, schools began to be built. The 11th Ward Primary Intermediate School, on Roseville Avenue, was 'a building of wood, two stories with very light and airy rooms, capable of receiving 150 pupils.' In 1860, the Roseville Methodist Church dedicated its first building at Warren and Gray streets. By 1873, the South Eighth Street School opened, and later the same year the Roseville Athletic Club was organized. Its one-story clubhouse on Orange Street included bowling alleys and a modest gym. Subsequently, $3,000 was subscribed for the Roseville Tennis Club at 7th Avenue and Seventh Street, famous as its name indicated for tennis, but also for archery contests and Saturday afternoon band concerts. The City Trust Co. opened April 24, 1901, paving the way for other improvements. By 1917, the Newark News described the community as having 'all the requisites of an independent community, churches, schools, social and political and business organizations, the Essex Troop Armory, a Masonic temple, moving picture shows and theater.' With amenities such as the Fifth Police Precinct, fire-engine houses, a postal substation and a branch library, the area had become an attractive residential site and prosperous business center. Roseville also had an admirable weekly newspaper, the Roseville Citizen. Three trolley lines, scores of jitneys to Newark and 74 daily trains to New York, kept the residents in close communication with the metropolitan area. The old 17th century Tompkins farm was well on its way to becoming a vibrant 20th century small community. Just south of Second Avenue and North 13th Street, wedged between Bloomfield and East Orange, was the Great Boiling Spring. At one time a shallow pool, 30 to 40 feet in diameter, its surface was agitated by several springs which bubbled up through the sandy bottom. A small stream carried off the water toward the west, and was one of the feeders of Silver Lake. The Great Spring was such a distinctive landmark that several municipal boundaries were pegged to its existence. In 1806, it was used in describing the boundary between Newark and the Oranges: 'Beginning at a spring called the Boiling Spring on the land of Stephen Day; running thence in a straight line southerly, etc.' In 1812, Bloomfield Township used the spring to describe its shared boundary line with Newark, stating, 'At the Green Island in the Passaic River; and from thence running westerly to the northeast corner of the township of Orange at the great boiling spring.' For many years, the Orange Water Co. used it to supply some of the water needs of East Orange. But by 1910, the East Orange and Ampere Co. developed their nearby land holding and drained off the water through an underground conduit. No trace of it remained. In its heyday, another spring, the Gild Spring, was not only used as a source for water supply but for occasional holiday outings. Doodletown developed within the Roseville section. Its boundaries include Bloomfield Avenue on the South, Branch Brook Park on the east and East Orange on the west. Its northern boundary was somewhat vague. It was largely located in the old 8th Ward, west of Branch Brook Park, and included Abington, Berkeley and Chester avenues west of the old canal or Newark City Subway. It included eight thoroughfares from Third through Tenth streets. With Doodletown's boundaries were Hemmer's furniture factory, the licorice factory and John Erb's shooting park. Theodore D. Gottleib described these boundaries in an article in the Newark News in October 1933 about Salvatore Intintola, who thought of Doodletown as a state of mind and not a place. 'His impression of it was a neighborhood that bred important local political figures including former Police Judge Nicholas Albano, Anthony Giuliano, former U.S. attorney, and Drs. Robert A. Cassicarelli and Joseph Albano.' Criticism over the name Doodletown was constant. Conflicting references to its use appeared in the press from time to time, but the name stuck and is remembered by many. ''Perhaps if we say we live in the North Roseville section of the city the expression sounds better, but it doesn't make us feel better.' (Salvatore Intintola, October 1933). In addition to buildings such as churches, schools, train stations, clubs, parks and bandshells, some people tend to remember a favorite store, movie theater, or malt shop in the inner recesses of their memory. Many older Roseville residents recall the butcher store owned by Norman Shawger in the 1940s. Started by his father William H. Shawger 70 years before, it began business on Roseville Avenue in the Four Corners section. In winter, deliveries were made by sleigh. Sam Feeney moved to Roseville from the Ironbound in 1910 and managed a grocery store on Orange Street. Herbert Trauth was a second-generation florist with a shop at Orange and North Sixth streets. He remembered when there was no rubbish pickup, and he had to drive to the city dump at Bloomfield Avenue where Schools Stadium was later built. Ewald Tillmes's stationery store was a popular place, also a second-generation business. George Tillmes, who ran a beer garden on the heights overlooking the Morris Canal, told of sheep hooves pounding the cobblestone pavement of Orange Street on the 'way to the Bathgate slaughterhouse.' May's Shoe Store, at 13th and Orange, was operated by Harold May. Fred Secker, manager of Steinlein's drug store, was in business for over 50 years. On March 2, 1948, he filled his 1,000,000th prescription. ''The Point' was established in the 1930s as a 'Depression store' by local churches. Shop owners donated food and clothing and local churches supervised the distribution of goods. By the 1930s, St. Rose of Lima parish was one of the largest and most active Roseville churches. A skating rink drew visitors from Newark and far and was also the traveling home of the Indian medicine show. And the circus appeared at Sussex Avenue and First Street and at the old 'asylum grounds,' now site of West Side High School. This was the era when Fred Cowan opened a fancy confectionery at Orange Street and Roseville Avenue, charging the outrageous price of a dime for an ice cream cone. Although his store didn't prosper, it was replaced by Stubb's, which became the wonderful old Grunings. At the time, all local Boy Scouts belonged to Troop 23 with George Moser as scoutmaster. When Route 280 came, Roseville's character changed dramatically. But, oh, for the memories!